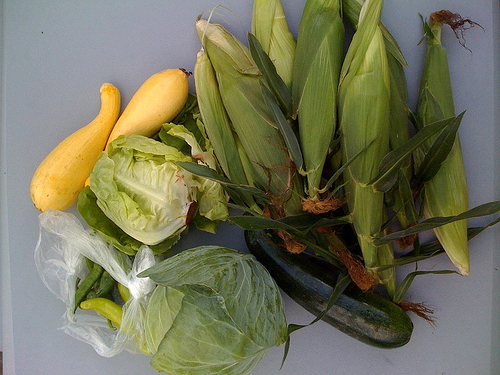 In our last batch of CSA veggies, we got some hot peppers. 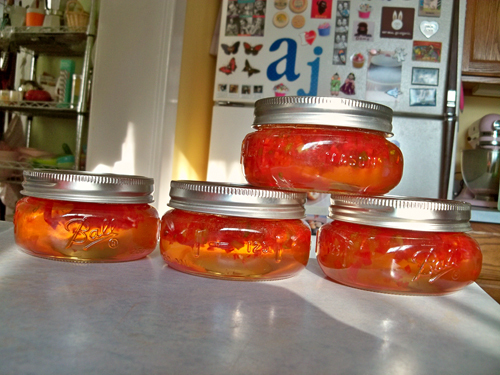 I didn't know what to do with them until a friend on Facebook recommended hot pepper jelly. Perfect! This will be so tasty on crackers with cream cheese or on toasted baguette with brie. Disolve sugar in the vinegar and lemon juice. Add the peppers and let boil for 2 mintues. Add liquid pectin and let rest for 10 minutes. Fill the jelly jars and let them seal. I eyed your canning book with envy and just put it on my Amazon wishlist. 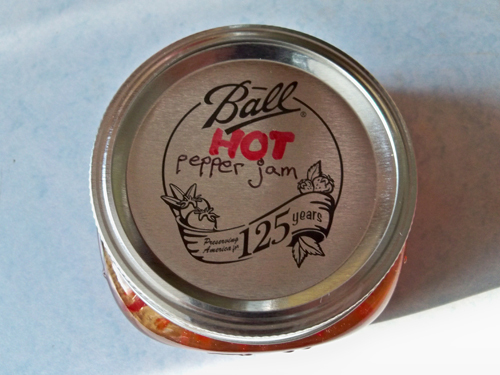 Please do share the recipe for your hot pepper jelly. I always wondered how these were made. Off topic, are you using a new camera? Your macro images are just amazing. Your pics are always nice, but the recent snaps just seem so much sharper. 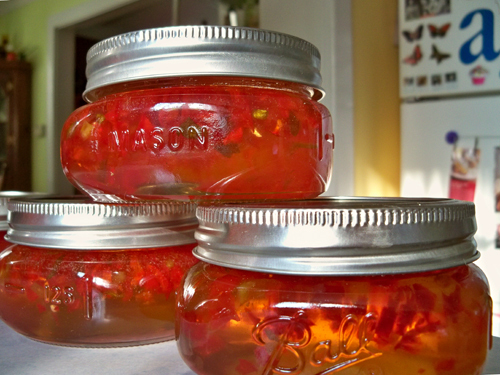 I would also love your hot pepper jelly because we are growing them this year. They seem to be the only thing that is growing like weeds. I think my husband would love hot pepper jelly! Linda - for awhile when I first got my iPhone I was using pictures taken with it for my blog posts - but then I realized that the photos just didn't look as good. I still use it occasionally like the veggie pic. But lately I have been using the Kodak Z950 for shots like the jars of jelly. I LOVE it! It is just amazing. The zoom is incredible. I was sitting so far away from the ponies in the post for Sunday. The colors, the sharpness... I highly recommend it! Oh... and I will post the jelly recipe tonight! Glad I could contribute to the pepper jam. I'll be in Rochester next week for a few days. I'll be sure to stop in and say hi. That looks heavenly-Those would make great gifts too! Thanks for sharing the recipe! We received a ton of peppers from our CSA-like delivery and I've been racking my brain thinking of what to make. Lori - please do stop by! I can't wait to catch up!